New year, new body? Sound familiar at all? I bet it’s a common resolution for us all – this year we’re going to the gym more, this year we’re running every Saturday morning, this year I will do the squat challenge every day. But what if we didn’t have to…? That’s right, you read mine own words correctly. What if we could get a perfect bod without the hard work? Well that sounds too good to be true of course. At least, that’s what I thought in 2013. But then these bad boys from Oriflame dropped through my letterbox and suddenly, the impossible seemed likely….. Right, what are we looking at? These sleek silver beauties are part of the Perfect Body range from Oriflame. We’ve got a stretchmark repairing cream, a cellulite dimple destroyer and a bingo-wing buster! HIYA NEW FRIENDS! Let’s face it, they’re not going to cut inches off your tum but they do claim to help tone up wobbly bits and smooth out the bumps. But did they work? First up – the Stretch Repair Anti-Stretch Mark Cream. Lord, I hate stretchmarks. They’re effectively scars – soooo hard to get rid of! This is a light but luxurious cream which dries reasonably quickly and doesn’t feel sticky. I haven’t seen any significant visible improvement that a good quality body moisturiser wouldn’t do but it’s more convenient for sure. I just need to remember to apply it everyday and maybe I’ll see the results! To be fair, I don’t expect anything to happen overnight, I’ve only been using it for 2 weeks. Second on the list – the Perfect Body Dimple Defence Anti-Cellulite Day Gel. This quick-drying gel is designed to target ugly orange peel skin, improve skin firmness and reshape body contours. I can’t attribute this solely to the Oriflame Anti-Cellulite gel as I have been using a mix of these gels for about 4 years now! I’ve used Garnier Body Tonic, Nivea Goodbye Cellulite cream and to be honest, they’re all very similar except for in smell and absorption. I probably couldn’t pick out any particular stars among them but this Oriflame one certainly runs with the rest of them and is perhaps a titch more quick drying too! Next – another gel for your jigglybits and jigglypuffs. (had to get a Pokemon reference in there, soz.) The Perfect Body Anti-Gravity Upper Arm cream! This one is specifically for that annoying wobbly bit around your arms which won’t go away no matter howww many weights you lift! I’ve never used anything like this before but current trials are going okay. My skin texture is definitely better: less goosebumpy, more smooth but there’s no visible reduction in size or squishiness yet. I’ve also been using it on my belly but again, nothing noticeable in size reduction as of yet. Boo. Nothing to equal lipo but I definitely noticed some good improvement in skin texture and tone. They’re decent, good quality products and I can’t wait to report again in month or so! At this point, I don’t think I’d pay £15 for each product though. That’s a reasonably premium price and Oriflame is still a relatively unknown brand. Not to judge a book by it’s cover but …..the packaging is a bit budget – a bit flimsy and a bit cheap looking. 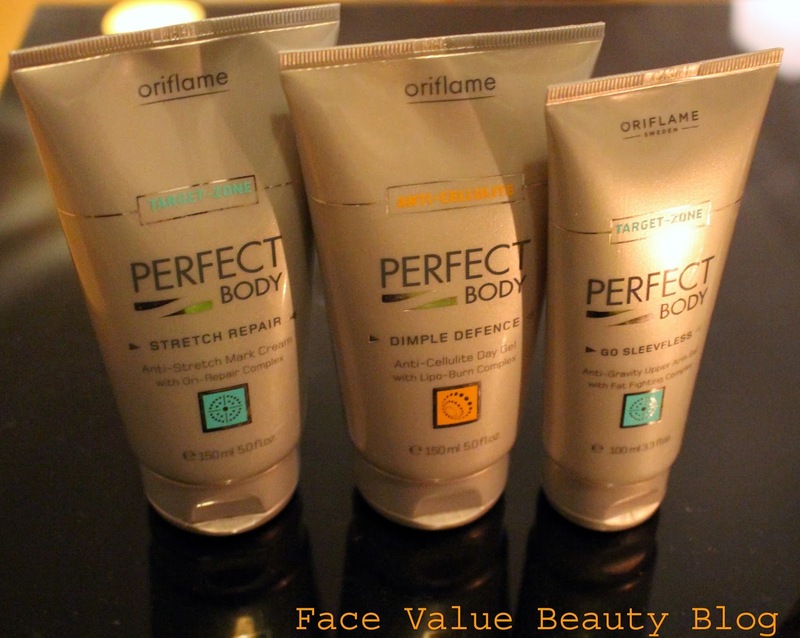 I’d probably pay £15 if Oriflame splashed up the packaging a bit more, but at the moment it’s on par with a high street brand like Nivea or Garnier. But who knows what the future holds? If I’m reporting back in March with a super-beaut bod, then £15 is NOTHING for a year of saved gym-memberships eh? Fingers crossed….! So what do you think? Have you used any products like this before and had good results? Or maybe you think it’s too good to be true? I haven’t made my mind up yet but anything that means I don’t have to go to the gym is worth a shot to me..! The word "hard work" is the key. Its not actual physical work. Its that you body gets a stimulus and has to work. Its just that most of the time, the easiest way to get there is by hard physical work.I doubt any cosmetic cream can actually make the body sweat inside. Exactly the set I need right now, stretchmarks, jigglypuffs & dimple are killing me. Thanks for the tips! Sounds temting. 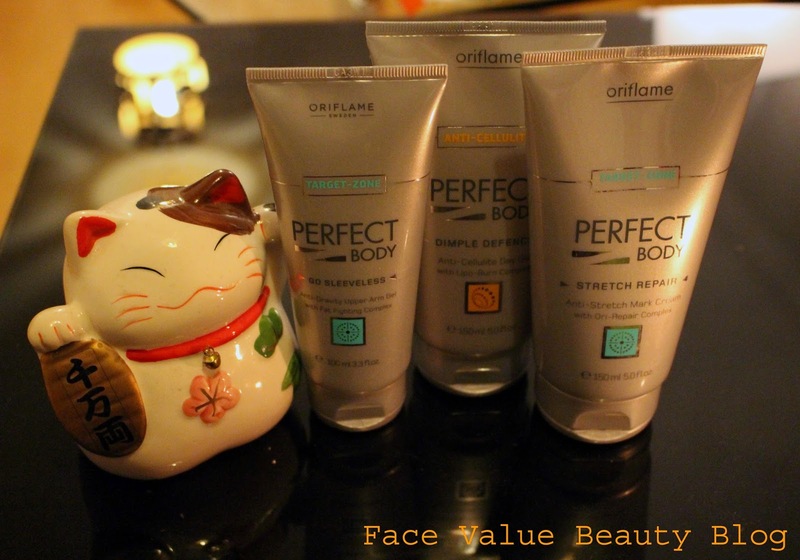 Maybe I'll try the Orifflame products. I once used an excellent anti-cellulite cream from Zepter that really worked on me. But it was retired off the market… I really don't want to know the reason and what were the real ingredients :|. That was many years ago, but I never found a cream as good as that one again.